Headset microphones are a staple of live music and public speaking, but can be prohibitively expensive. Fortunately, if a headset microphone is needed only visually and doesn't have to function as a microphone -- perhaps for a video or photo shoot -- there is no reason to spend the extra money; with a few common tools and inexpensive supplies, a realistic-looking prop headset microphone can be fabricated. Cut the wire hanger just below the hook and corkscrew section. Straighten the remaining portion of the wire hanger as much as possible. All the curvature will not straighten out; straighten it enough to work with it. Look in the mirror and bend the wire hanger around the back of your head, from above one ear to above the other ear, with equal lengths of wire extending beyond your ears on either side. Bend the wire hanger down around your left ear and mark it with permanent marker at about the middle of the ear. Bend the wire hanger down around your right ear. At about the middle of the ear make another bend, this one towards your mouth. Use marker to mark the wire hanger at about 1/2-inch in from the corner of your mouth. Remove the wire from your head, and cut it at the places you marked using wire cutters. Fully cover the cut ends of the wire with electrical tape, ensuring no sharp edges are exposed. Attach the electrical wire to the hanger wire. Wrap a small piece of electrical tape around both wires a few times. 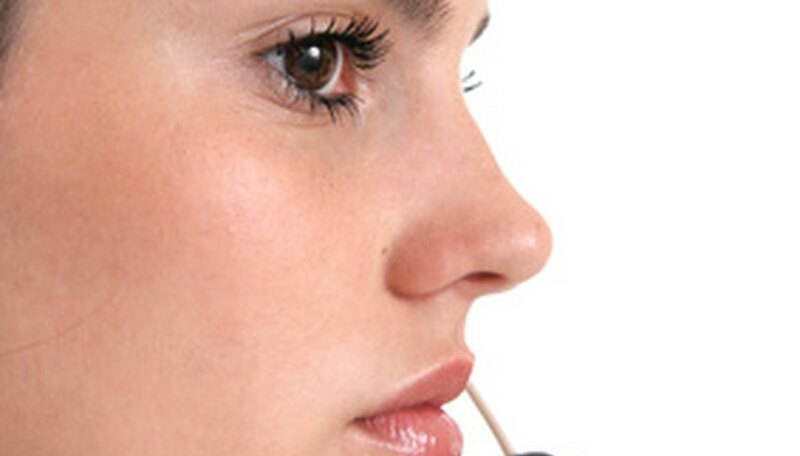 Start at the "mouth" end of the headset and continue at 2-inch intervals to about midway between the ear curves. Cover entire headset wire with heat-shrink tubing, ensuring both wires are covered where electrical wire is present. Use separate pieces of tubing where necessary. Heat tubing with heat gun, turning slowly as you go, until all tubing is snug. Attach the windscreen to the "mouth" end of the headset. Use a small dab of adhesive on the inside of the windscreen and allow ample time to dry to manufacturer's specifications. The fake "mic cord" lends authenticity to your headset. Tuck excess wire into some part of the artist's costume. Jacob Mishler has been working in the technical theater and live production fields since 1996. He has experience with live sound, lighting, video, set construction and design. A student of life who has always been interested in a wide variety of topics, Mishler's writing has been published in "Life" and "Rolling Stone" magazines. How do I Set Up JBL Speakers & Subwoofers?